Is your website prey to Google Mobilegeddon? Its been almost been two months that Mobilegeddon made its debut, and so far it seems that its not that significant..so far. So how far is Mobilegeddon ( Google’s Mobile Friendly Algorithm ) affecting your site? To find an answer to this question, the team at DesignLab has researched a bit and we have some good as well as bad news for you. Is that if your existing website is not mobile friendly, then this really has got nothing to do with your desktop & tablet ranking. This means that if your website was performing really well in the desktop results, then it will most probably be there were it is and MobileGeddon has got nothing to do with it. 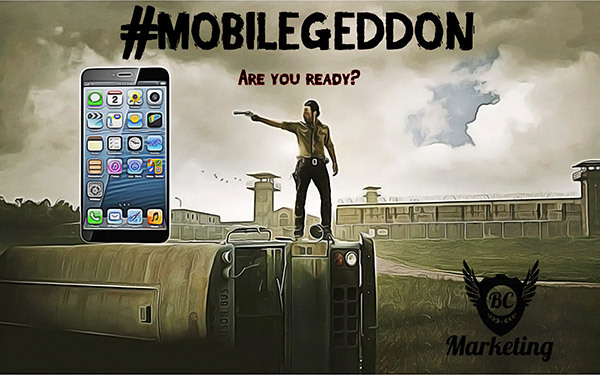 MobileGeddon was officially launched on 21st April and is still under a implementation stage. So, untill and unless your website is not crawled by the Google spiders, there are chances that it will most probably stay were it is. This gives you some extra time to get your site mobile ready. So hurry up! Google is saying that 60% of its searches come directly from mobiles. So, if your website is not mobile friendly then there is a real string possibility that you might attract only 40% of the audience that searches for something on a desktop. Apart from this, we have seen a big drop in some of our clients ranking. The websites that were ranked in top 10 for mobile results have just dropped to 20 position. So, even if Mobilegeddon is in the primary stages of its implementation, there is still a possibility that your website may fall prey to it, and maybe already has while your’e reading this. So, what should be your approach towards MobileGeddon and how seriously shall you take it? Now the first thing you must do is just go ahead and check if your website is mobile friendly or not. To do so, just enter your website in the text box below and hit submit. 2. Send us your website and we will get back to you with a quote for converting your existing website into Mobile friendly site. We convert existing static websites into responsive websites and even Responsive WordPress websites. I know this seems daunting, especially if you have just recently designed your website, but as I keep saying to all our clients web design is always changing and ever evolving and if you want to run your business online you need to keep ahead of the game. Call Spiros on 0431 926 575 anytime, he is happy to answer any questions. May 29, 2015 admin Google, SEO, Web Comments Off on Is your website prey to Google Mobilegeddon? How to get on the Top Page of Google! There has been many statistics which prove people don’t click beyond the first page of Google search results, so if you want to be seen, you need to be in the top listings on first page. To do that, you need to learn a bit about how search engines work and how to optimise your site, more commonly known as Search Engine Optimisation (SEO). Once the search engine knows your site exists, they scan your site and index the information, then analyse the content to determine how and where your website should display on the results page. If your site isn’t optimised, then it won’t rank well at all, and could end up well below your competitors. Each search engine has its own set of rankings and listing criteria, but they all work the same way, let’s look at the same basic elements. Keywords – These are select words and phrases that someone would use when searching for your product/business. You want to choose 5 to 10 words or phrases that best represent your product/business, then use those words and phrases frequently on your site (but only where it makes sense — whatever you do, don’t cram them in because Google will know). 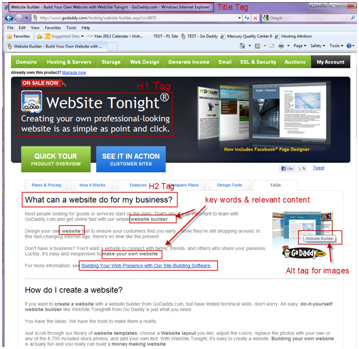 Title Tag – The title tag is a short summary of what potential customers can expect from your page. It displays in a few important places, including the browser’s title bar, and as the title for your listing in search engine results. 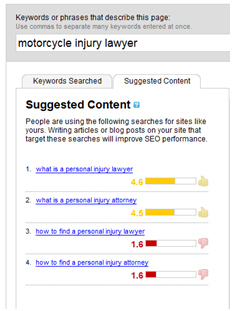 If you target a specific audience, possibly consider including that in the title, like “motorcycle accident in Arizona.” It helps if each page on your site contains a unique title, but keep it concise — around 65 characters. Description Tag – The description tag displays below your website’s link in search results and should entice people to visit your website. Every page in your site should include a unique description using the keywords for that page. Keep your descriptions less than 250 characters and avoid non-alphanumeric characters. Header Tag (H1 Tag) – Every page in your website should include only one header tag. It doesn’t display in the search results, but it’s the largest or most prominent text on your page. The header tells a visitor what they’re reading. Keep it brief – no longer than a short sentence. Page Content – Your content, the text that your visitors will read, is really important for search engines. Use between 350 and 650 words, including those keywords we mentioned above, one good thing is to bold each of the keywords once on the page. And always make sure everything on your site is original material, do not copy and paste from other competitor websites. Google will know. Interesting Fact: Google can tell (and will probably penalise you) if your content has an excessive number of keywords. Link Building – Links can be a big factor in how search engines rank your site. There are two: interlinks and back links. Interlinking is creating a link from a keyword or sentence on one page to another area of your website. For example, the sentence “Find an lawyer near you” would be linked to the list of office locations on your site. A Back link are other websites that link to your site. Google weighs this more heavily when determining your site’s rank, and unfortunately these are more difficult to achieve. An easy ways to create back links are listing your business with online directories (such as Yelp, TrueLocal and social media). You could also contact other business owners online in your area of business and offer them a link exchange. Menu Navigation – Navigation refers to all the links on your website. Visitors and Google both rely on good navigation to get around your site. Broken links are like hitting a wall, so be sure to check your links regularly and make sure they are all working. Sitemap – A sitemap is essentially the map of all the pages in your website. Sitemaps will guide a search engine throughout your website with the names and locations of pages. They can speed up indexing and, in some cases, increase site traffic by indexing previously buried pages. Image Tag – Images are good to break up the text and add a visual appeal to your website. Be sure to include an image on every page, and format it with an “alt” attribute using those keywords we mentioned. Because search engines can’t see images the way we do, they depend on alt attributes to appropriately catalog and index the image. Tip: Optimising your images, so the file size is smaller and the image loads faster, can also help your search rankings. We have all heard the phrase “Location, location, location!” in real estate. This also applies to your search engine ranking for your website — the higher your site is listed, the more traffic you get. Getting to the top of Google is what every business wants to achieve. And there are some simple steps to getting your business high up the Google rankings. And it’s possible to do it without spending a dollar. First step is to spend some time understanding what your customers are already looking for, and then align your services and content around that. Google’s Keyword Planner & Google Trends are free tools to use, and will give you an idea of what people are searching for online. If you can place a search box on your site to help you discover what your customers are looking for. Think about how relevant the key word term is, and how you can best compete with other online businesses. For example, we target the term “graphic design adelaide” rather than just “graphic design.” Despite having far fewer searches, this keyword is far more likely to convert to a lead, also because targeting a location helps better narrow down a potential customer finding you geographically. This helps Google understand what pages are important for your’e site, and will allow users to find helpful content. And there are many tools online to help you spot and fix code errors, one example is the IIS Toolkit. There are a number of tracking tools available to help you understand how well you’re doing online. Google Webmaster Tools will give you an indication of exactly what Google sees when it visits your site. Factors such as site speed, 404 errors, broken links and site significance are all listed here. Make a list of the people your business deals with on a daily basis and then ask them to link to your site, pointing out the fact that your site ranking well will also benefit them. Also try searching your own brand name online to find people who already talk about you, then ask them to add in a link. Another easy win is to submit your site details to relevant directories. Get involved with your customers on social media. Share your insights and thoughts with your market to show search engines you’re an authority in the space. Not only will this give you an advantage over competitors, but it will encourage your customers to recommend you on social networks, or write positive reviews online. Google considers all the signals it can when ranking sites, so the more you’re doing, the better. You can attract visitors to your site a variety of ways, but one of the most effective ways is being listed at the top of the “organic” search results on search engines like Google and Yahoo! Unlike paid listings, which are advertisements that display in sponsored areas, organic results are free and based on, among other things, the site’s content and how closely it matches the keywords being searched. Search engine optimisation can have a large impact on the success of your business online. The good news is that with the tips presented in this blog, you have the basic steps you need to get started. Take a little time to tune up your site and watch your customers grow with your search results.